Police in Kosovo have seized more than €2m (£1.76m) in fake banknotes, in what authorities say is the largest seizure in decades. A taxi containing two men, identified as being from Cameroon and Albania, was stopped entering Kosovo at the border with Albania on Friday. Police discovered fake banknotes in €50, €100, €200 and €500 denominations in a bag in the taxi's trunk. 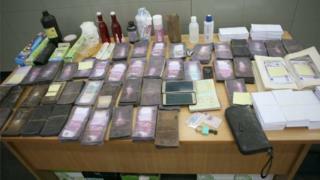 Sheets of paper cut to banknote size and printing chemicals were also found. Kosovo police said that after counting the notes, they had found the face values totalled €2,131,000. Two Cameroonian passports and a residency permit for France were also confiscated, police said. Both men were taken into custody. Kosovo has an unenviable reputation as a smugglers' haven, the BBC's Balkans correspondent, Guy De Launey, says. Historically a province of Serbia, Kosovo declared independence in 2008 and is supported by EU legal officials and Nato peacekeeping troops. It is recognised by the US and most EU countries but not by Serbia or its ally Russia. In November, about €13m in counterfeit notes was discovered in nearby Bulgaria in bundles of the €500 denomination. The European Central Bank announced it would stop producing the €500 note by the end of 2018, amid fears that its high value facilitated criminal activity.